BY BRENDAN SKWIRE When I tell people I’ve never been to the Philly Folk Festival and never plan to, I invariably hear “but you’re a bluegrass fan, and there’s always at least one bluegrass band at the Philly Folk Fest.” This is true… but I’m picky about my music, and generally not willing to pony up the bucks to sit through a bunch of bands I don’t care for just to hear 45 minutes of music I like. But this year, I may have to make an exception, because bluegrass legend Jesse McReynolds is making his first appearance in Schwenksville for the first time in nearly 20 years. 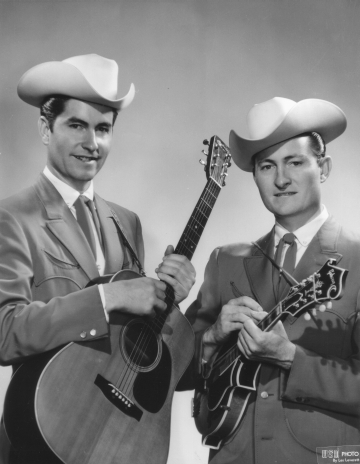 Until his brother died in 2002, Jesse was the mandolin playing foil for his high-singing brother and fellow bandleader in the groundbreaking bluegrass band Jim and Jesse and the Virginia Boys [pictured, below right]. While the band played traditional music with the best of them, the two brothers were deeply influenced by rock and roll, country, and other pop music: old radio shows feature surprising selections by Buck Owens and Hank Williams, and the band later put out albums like “Berry Pickin’ in the Country”, a tribute to Chuck Berry. 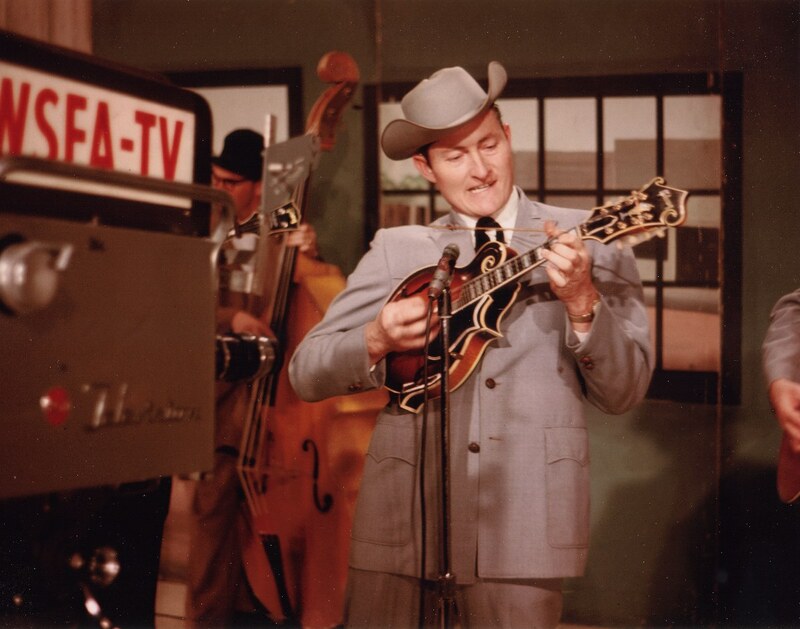 Today, Jesse’s 81 years old, and carrying on the traditional bluegrass music he and his brother made famous, while continuing to leave his own mark on the music. I got a chance to catch up with Jesse this week. “I got called into the Folk Festival about two weeks ago,” Jesse told me, “but the last time I played the Philly Folk Festival was about 20 years ago. I’ve been doing a lot more folk fests lately though, played up in Maine and Connecticut last year. I’ll tell you, they’re a lot bigger in terms of the variety of music. “Drive” is a particularly apt word to describe Jesse McReynolds, who I’ve seen perform almost every year: he may be 81, but you wouldn’t know it by the way he literally sprints out onto the stage, jumping around and moving like a man at least 30 years his junior. “For the last 25 years, I’ve been drinking BarleyLife, a mixture of barley juice, kelp, and other stuff. It keeps me very energetic, so I stick with it. The fact is, the people who put the stuff out did a story on me when I was 80 years old. Called me “the Iron Man of bluegrass”. On this particular folk fest tour, McReynolds will be backed by the Horst Brothers. “My grandchildren, who are in the current band, are branching out themselves with the McReynolds Tradition. They’re booked for Kentucky this weekend, so I’m bringing the Horst brothers in, I’m just going to fly up there.” Jesse’s looking forward to his first visit to the Festival in two decades, and with a guarantee of some of the hottest bluegrass around, folk and bluegrass fans are eager to see him too. This entry was posted on Saturday, August 21st, 2010	at 3:03 pm	and is filed under News	. You can follow any responses to this entry through the RSS 2.0	feed. You can leave a response, or trackback from your own site.